Never underestimate the power of one kind gesture. We all have hard days. Sometimes hard weeks, months and even years. We allow self-doubt to creep its nasty self into our minds. We question our decisions, our goals and ambitions. Sometimes we can crawl out of these toxic thoughts on our own, but often it requires the support and encouragement of friends. They don’t always know their tossing us a life line by what they say or do but sometimes those unexpected gestures are the most powerful. They come out of nowhere exactly when we need it most. As if they knew. It’s the universe working its crazy serendipitous magic again and again. It was exactly what I needed to hear at exactly the right time. A reminder to stay true to YOU. Stay true to your vision and who you want to be. I’m not sure if she will ever realize the impact of that simple note. 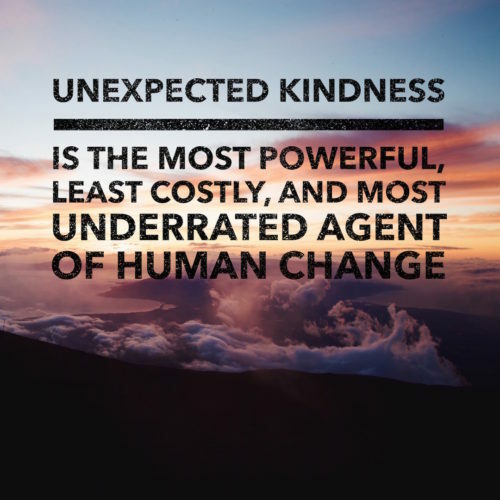 It was also a reminder to NEVER underestimate the power of one kind gesture. Go be you and shine your crazy, wonderful light on the rest of the world!